Now there was a certain disciple at Damascus named Ananias; and to him the Lord said in a vision, "Ananias." And he said, "Here I am, Lord." So the Lord said to him, "Arise and go to the street called Straight, and inquire at the house of Judas for one called Saul of Tarsus, for behold, he is praying. And in a vision he has seen a man named Ananias coming in and putting his hand on him, so that he might receive his sight." Then Ananias answered, "Lord, I have heard from many about this man, how much harm he has done to Your saints in Jerusalem. And here he has authority from the chief priests to bind all who call on Your name." But the Lord said to him, "Go, for he is a chosen vessel of Mine to bear My name before Gentiles, kings, and the children of Israel. For I will show him how many things he must suffer for My name's sake." 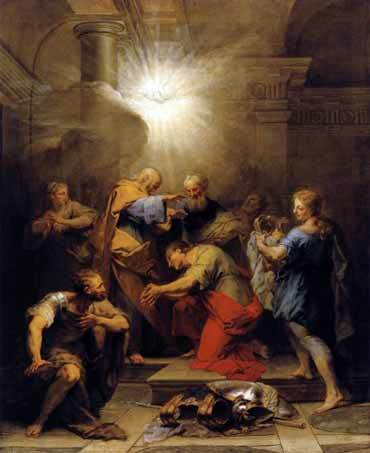 And Ananias went his way and entered the house; and laying his hands on him he said, "Brother Saul, the Lord Jesus, who appeared to you on the road as you came, has sent me that you may receive your sight and be filled with the Holy Spirit." Immediately there fell from his eyes something like scales, and he received his sight at once; and he arose and was baptized. Can you imagine what was going through Ananias' mind when the Lord told him to go find Saul of Tarsus and put his hand on him? Saul was by this time infamous among the followers of Christ. Asking one of them to seek out Saul was like asking a German Jew in 1940 to go and find Heinrich Himmler, or for a secret Jew in 15th century Spain to go find Torquemada, the head of the Spanish Inquisition. But God has chose Saul to spread his word to the world. It takes only the faith of one man, Ananais, to initiate this change. It was terribly difficult for Ananais to reconcile to someone who has been his enemy, and it is still so. We all have people we just do not like, people who threaten or even terrify us, people we don't want to talk to. But we must always be ready in our hearts to change our attitude towards them. We must never let our emotions become calcified and decide someone is our enemy forever, based on past experience. God did not need Ananais to help Him change Saul. He could have sent an angel to heal Saul's blindness. He used Ananais to demonstrate a point to us — that we must be ready to follow Jesus' command to forgive our neighbor. This extends even to those who are more powerful than us and who have sought to abuse their power to hurt us. We might wait for some sign before doing this; we might not have the strength to approach someone who would hurt us repeatedly. But we must be ready to accept change in such a person. We might find that such a person is not as fierce or inimical as we thought. At any rate, the clear lesson is that we must not harden our heart to anyone. Saul was, in effect, a mass murderer of a class of people that included Ananais. But Ananais showed us just how great our forgiveness of others must be. If they really do change, we cannot harbor either vengeance or fear of them. Finally, these verses contain the famous words, "like scales falling from his eyes". Saul literally "saw the light". Remember John 1:4, "In him was life; and the life was the light of men". Saul's blindness and subsequent regaining his vision is an outward manifestation of the miracle that occurs within him. He is made physically blind, to demonstrate his realization that he has been blind to the light. Again in John 1, "the light shined in darkness, and the darkness comprehended it not". But the scales fall from Saul's eyes; he sees the light clearly, and undergoes a transformation, from the greatest suppressor of Christianity, to its greatest missionary.